If you are looking for a beautiful contemporary wall mirror or overmantle mirror that's a bit different and has all the quality and sophistication of a handmade, made to measure or bespoke mirror and at a great price -then you have come to the right maker! 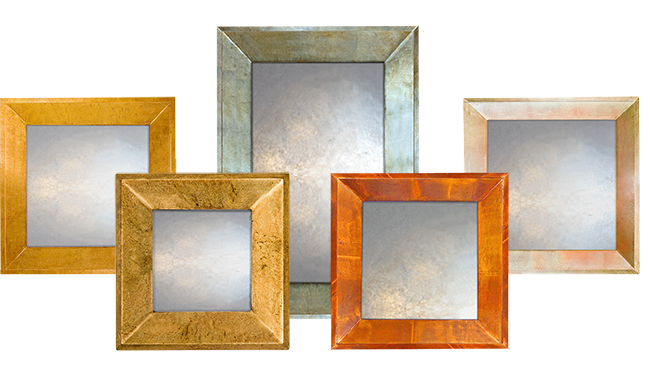 My comprehensive collection of contemporary wall mirrors offers a choice of different mirror profiles. This section covers my raked profile mirrors. 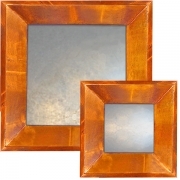 You can see the other types of mirrors that make up the collection by clicking on Contemporary Mirrors. 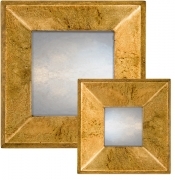 Take a look at any of the gilded mirrors laid out below for more detailed information and prices or get in touch if you would like to discuss your requirements. 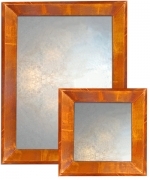 What distinguishes my gilded mirrors are their gilded finishes. There's nothing like them around as the new tarnish finishes I've developed are some thing I've come up with and are exclusive to me. It's taken some doing but it's made all the difference as traditional gilding only offers a choice of gold or silver! 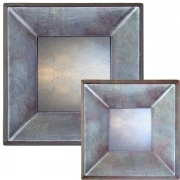 As a decorative artist with only two colours to play with I had to do something new & innovative & after a lot of trail & error I created my new Contemporary Mirror finishes. I've now got a whole new range of finishes to play with. 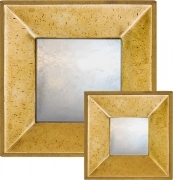 A stunning range of gilded finishes to choose from. There's an added benefit as the tarnished finishes are iridescent & have dynamic qualities as their colours subtly change as the light plays of their surfaces. That's why I used the angular geometric plains that make up my raked profile mirrors. Any shape or size of mirror. As hand made mirrors I can adapt my existing mirror designs to your requirements or make you a beautiful bespoke mirror . So if you are looking for a small or large mirror in any shape I can make the contemporary mirror or overmantle mirror of you dreams.